Love creating things that are meaningful, beautiful and fun to make? Do you like to avoid mass-produced items that end up in the recycling or garbage after just one use? Want to include a unique and personalized decoration at your kid’s birthday celebrations? 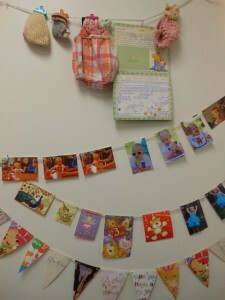 Look no further than birthday bunting using your own mementos! Building on this tradition, we can capture the passage of time by creating birthday decorations using mementos we have collected. The main items to use include pregnancy announcements, baby shower invites, baby shower cards, birth announcements, baptism invites, christening cards and birthday cards. 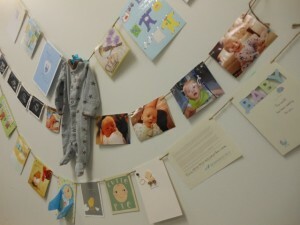 To really attract attention to the bunting I recommend adding ultrasound pictures, photos from the birth day, and birthday photos from each passing year. 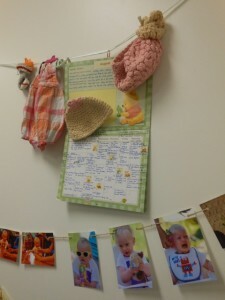 If you still want to keep going, add those 3 dimensional keepsakes you’ve been holding onto as well: hospital wristbands, soothers and their first & smallest items of clothing. Not only is birthday bunting wonderful to look at, it is also a great way to showcase what is hiding in a box somewhere in the closet! How many baby books and photo albums do we have that remain out of view, collecting dust? Birthday celebrations are a great time to get them out and reminisce with them. This may be a little presumptuous, but imagine showcasing birthday bunting, years later at your little person’s graduation, big promotion, or wedding…that could be a hit! Forego perfection. If you start a few years into their life, so what – better late than never! Hole punch your items before stringing them. Fasten your items securely to the string using clips or tape as they shift when moved. Limit your string length; if it is too long it gets unwieldy. Label your items if you want to remember details down the road. By creating birthday bunting, we visually remind ourselves and our children of all the wonderful people, over all the years, who have supported and been excited about their life and shown it with loving sentiments and well wishes – and that’s just cool. As always, if you have any comments or suggestions, please email us. We love to hear from you. Having caught the organizational bug early on trying to “balance” things out as an elite gymnast, Jessica Tudos brings diverse skills and experiences to her professional organizing. Drawing from her global work as an experiential educator, author, and motivational speaker, Jessica is on a mission to empower people to lead healthy, creative and organized lives.